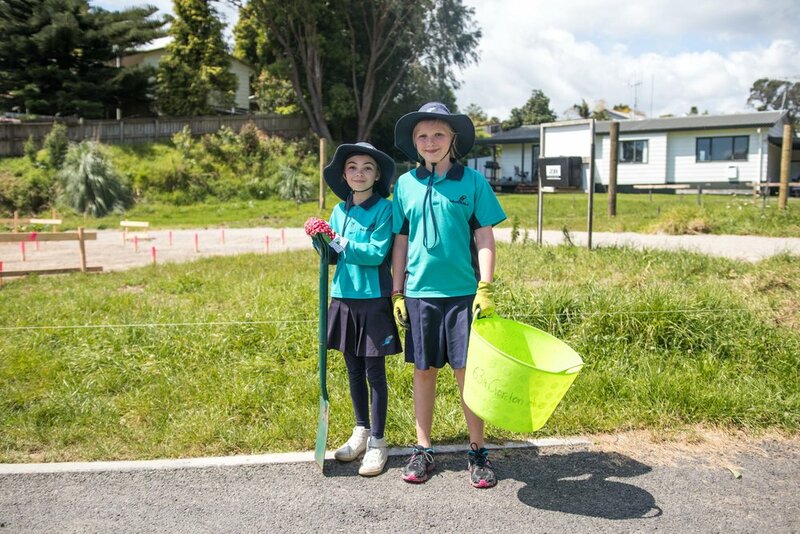 Meet the organisation teaching New Zealand's kids how to recycle. Paper4trees exists to educate all sectors of the community on the importance of eliminating waste for the benefit of local communities and the global environment. We believe a key part in encouraging behaviour change starts with eliminating barriers, starting with youth, and establishing a sustainable norm from preschool age - high school, with the hope that this habit will carry on into their adult life. Paper4trees was started 17 years ago because most schools were burning and landfilling all their paper and cardboard. Paper4trees was a new concept for schools. It allowed them to have their entire school set up with recycling bins for free. All they needed to do was get the paper and cardboard from their classroom bins to a larger bin outside the school. The barrier for recycling for most most schools was the cost of buying the bins, setting up the system correctly and having a formal system that the whole school could understand. It exists to assist schools with recycling and it exists to ensure more trees are being planted by school children. Paper4trees encourages schools and preschools to divert paper and cardboard from landfill, which in turn preserves landfill space and reduces greenhouse gas emissions. We eliminate barriers to recycling within the classroom, by providing classroom recycling bins free of charge. For paper and cardboard to be recycled, it needs to be separated at the source. The contents of these bins can then be transferred straight into their kerbside recycling bin, or taken directly to their local recycling centre. As an incentive to divert as much of the paper and cardboard they generate from landfill as possible, we reward each school and pre-school with one native tree or plant for every 2 cubic metres of paper and cardboard they recycle. The native trees are a good incentive as it teaches children about replenishing resources as you use them, and also helps to restore our natural environment. What are the biggest challenges facing the environment in New Zealand? It is not high enough on the agenda for central government. Tourism is now our biggest earner, and we really need to up our game when it comes to zero waste. We need to be a world leader again - and we were at one time. Central government needs to get tougher on producers and the packaging industry. Plastic in our marine environment is too high. We need to do more to endure plastic bottles and all other beverage containers carry a deposit like most of the Canadian provinces, European Countries and Australian states. We have a billion beverage containers going into the litter stream each year. What changes for New Zealand if more students learn about the benefits of recycling actively? No more beverage containers to landfill because they have a value. No more electronics to landfill because we would pay for the recycling up front. No more piles of illegal tyres dumped because they have a recycling fee paid at purchase. What help does P4T need? Paper 4 Trees needs more sponsors so they can effectively run their programme! It's an ideal partnership for businesses looking for a project that engages with kids and families, schools, and has an environmental core. Sponsors who can give $10,000 or $20,000 per year make a huge difference, as can businesses who support a cluster of ten schools each year, and that encourage their networks to do the same. Paper for Trees are a registered charity in New Zealand, so when you back P4T, 100% of your donation goes to their programmes, and it also counts as a tax deductible donation. If your business is interested in supporting Paper4Trees this year, or you want to find out more about the different levels of support you could give as a corporate partner - get in touch with our matching team and they'll send you some more information.